How to Make Ice Cream Without a Machine with 3 simple no churn methods and flavor ideas! Step-by-step video, recipe, and printable ice cream labels too! Oh man do I have a treat for you today! And not just in the form of a sweet recipe. I’ve been working extra hard to make this special post for you which is just jam-packed with awesome stuff. 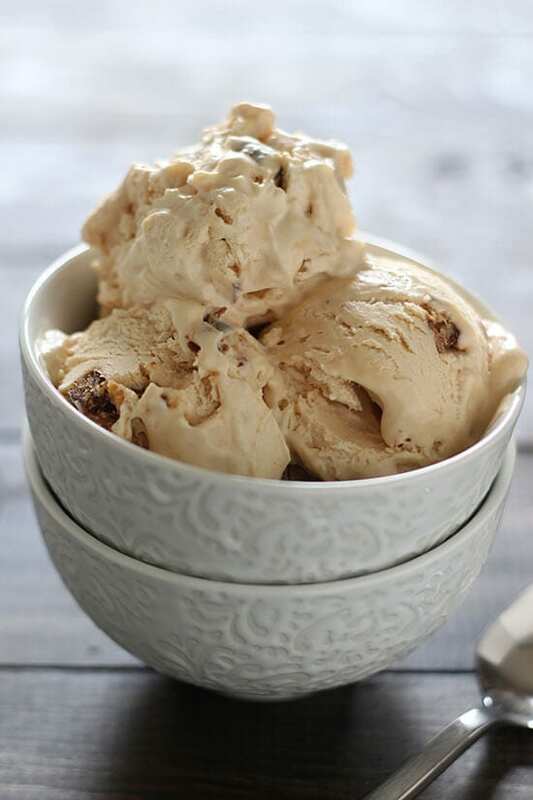 You’d think after writing an entire cookbook about ice cream I’d have nothing more to give on the subject – but that couldn’t be further from the truth! Something I get asked ALL the time is how to make ice cream without a machine. I understand that not everyone has an ice cream maker (or two like me…) and since I just adore mine I’ve been hesitant to talk about making ice cream without one. While I believe a machine produces the best results, I’m sharing the next best thing for those of you who don’t have one! In this post and the step-by-step video below I cover three different methods for making homemade no-churn ice cream. One method requires just two ingredients, and the others can be used with ANY recipe. You may remember one from science class! This can be a super fun DIY project or just a way to satisfy a frozen craving. Either way, I just adore using those classic white ice cream containers. It’s like making homemade Ben & Jerry’s. I got mine from Amazon, but I’ve also seen them at craft stores or speciality kitchen stores like Sur la Table. They’re pint sized, so since each recipes makes about 1 1/2 quarts a single batch will fill 3 of the containers. I like to divvy up a batch of the ice cream base and and make two or three different flavorings! I’m all about variety. Don’t forget to sign up for new recipes delivered to your inbox in order to get your hands on the free ice cream label printable! Click here to get the labels. Note: some mix-ins may increase the amount of time the ice cream needs to freeze before serving. 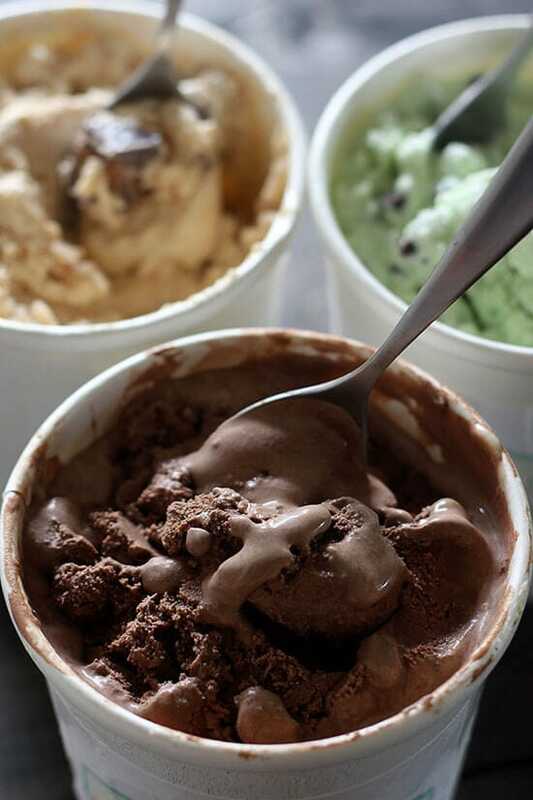 Also be sure to check out all my ice cream recipes for more inspiration and guidance! 1/2 – 1 cup caramel drizzled over the almost frozen mixture, stir to break up the ribbon a bit. Add a teaspoon of sea salt and/or a few tablespoons of bourbon for a gourmet touch! 2 cups fresh blueberries + 3 tablespoons sugar + 2 tablespoons lemon juice cooked in a small saucepan over medium-high heat until burst. Chill before swirling into ice cream. If you want to use the last two methods with homemade custard-based ice cream, check out this video tutorial. In the bowl of an electric mixer, whip the cream until stiff peaks form. On low speed, mix in the condensed milk, vanilla, and any flavorings. Pour into a resalable container, cover the surface with plastic wrap, then seal. Freeze for at least 6 hours, or until firm. Keep stored in the freezer. In a large bowl, use an electric mixer to beat the milk and sugar until the sugar is dissolved, 1 to 2 minutes. Stir in the cream, vanilla, and salt until combined. If mixture isn’t cold, place in the refrigerator until chilled, about 30 seconds. Place the mixture in a deep stainless steel baking dish and freeze for 45 minutes. As it begins to freeze near the edges, remove it from the freezer and stir vigorously with a spatula. Return to the freezer. Continue to check the mixture every 30 minutes, stirring vigorously as it’s freezing. If you have a hand held mixer or blender, use one of those. Repeat this process for 2 to 3 hours, or until frozen. Place the ice cream mixture in a quart size resealable bag, squeezing out as much air as possible and sealing tightly. Place this bag inside another quart bag, again squeezing out as much air as possible and sealing tightly. Put the bags inside a gallon size resalable bag and fill with about 4 cups crushed ice then sprinkle with 4 tablespoons coarse salt. The salt lowers the freezing point of the ice and creates an extra cold environment that aborbs heat, causing the ice cream base to freeze. Squeeze out all the air and seal tightly. Wrap the bag in a towel or put gloves on before shaking vigorously and massaging the bag, making sure the ice is surrounding the ice cream mixture constantly. Shake for about 5 to 8 minutes, or until the ice cream is frozen. The more vigorously you shake, the smoother your ice cream will be. For the 2 ingredient method. The directions say to fold the whipped cream into the condensed milk mixture, but in the video you added the condensed milk mixture to the whipped cream and mixed. Does it make a difference which way you do it? I’ve seen videos and recipes using both methods and I’m utterly confused! 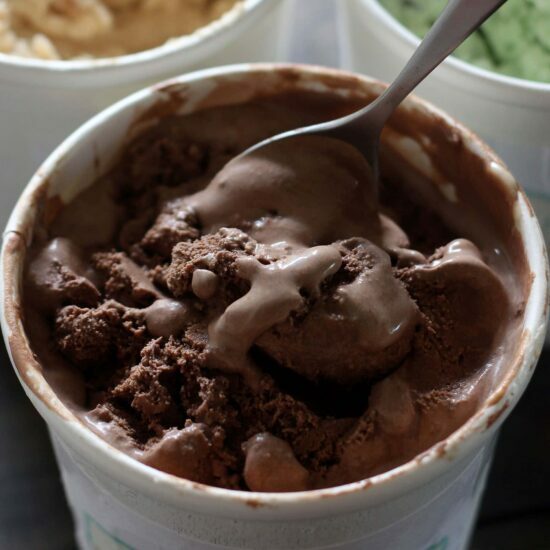 – I need to make me some Chocolate Malt Ice Cream! Hey Kat! Thanks for bringing this up, I meant to edit the recipe! I actually tested both ways and it doesn’t make a noticeable difference. So there’s really no need to worry about folding 🙂 I edited the recipe to make it that much simpler. Yay! I’ve actually had it for many years and used it to test all 50 ice cream recipes in my cookbook. I’ve literally used it hundreds of times and it’s still going strong! Hi Tessa, I just received the link to download the labels. They are adorable! Did you design them yourself? What kind of labels did you use to print the labels? Can you reference an Avery number? Thank you. Thank you Patty, glad you like them! I used Canva.com and Photoshop to make them 🙂 I’m sorry to say but I had one sheet left of label paper that I used to make them and I have no idea what kind it was. I will say that I wish I had used glossy label paper. Thank you for the information on your ice cream maker. I am ordering a copy of your ice cream book to go with my new ice cream maker. Thanks! Thank you for doing all of this legwork so that ice cream fiends like myself can make ice cream without a machine! The number of ice cream recipes I’ve pinned and looked at longingly on Pinterest is just sad 😛 I’m hesitant to get a machine because we have so little space in the kitchen as is, so this looks PERFECT. Looking forward to trying the two-ingredient method in particular! Awesome Sophie! Hope you love the two-ingredient method! Would the first method work if you whipped the cream in a food processor? I’ve actually been thinking about getting that same exact ice cream maker you mention in your comment. Hahah I’ve had it bookmarked for a while now. It looks like it has pretty good reviews and the price isn’t bad. Especially compared to some of the other machines out there that are near or in the hundreds. Btw, under freeze & stir or plastic bag methods it says: “If mixture isn’t cold, place in the refrigerator until chilled, about 30 seconds. If mixture isn’t cold, place in the refrigerator until chilled, about 30 minutes.” I assume the first one shouldn’t be there? I don’t see why not Carly! And I really can’t recommend that ice cream maker enough. Thanks for catching that – so weird it ended up in there twice. Fabulous Kristin! I know all about 114°F+ heat and making ice cream, glad to hear it still turned out 🙂 And aren’t those containers adorable?! even though i am 73, i still enjoy bringing a little happiness to others. i can hardly wait to make milano cookies and the ice cream. i hope they turn out as beautifully as YOU LOOK… (now you print that, Tessa). Hey Tessa! Loved your tutorial for making icecream without a machine. I’ll soon be ordering a copy of your faboulous icecream book to go with my brand new icecream maker. Your labels are just adorable. Looking forward for 2 ingredient method. Thanks a lot. It really helped a lot. I loved this recipe, just one thing. when i did the 2 ingredient method, the first time it was really hard and i couldn’t get my spoon in it , the second time i put it in the container in a plastic bag and it was perfect. Sounds like the first time the container wasn’t airtight! We just invested in some new food storage containers because our old ones lost their airtight seal. On the freeze and stir method- it says 11/4 cups milk chilled. Should that be 1/4? If your using a glass measuring cup 11/4 is 14 ounces. I looked it up. I made this recipe. It was super easy and my kids love it. Thank you. I just found this site and I’m excited about trying the recipes. BTW, has anyone been able to convert the ingredients into a PALEO friendly version; especially a substitute for the sweetened condensed milk? I believe you miscalculated as one and one quarter cup would = 10 ounces (i.e., one cup =’s 8 ounces and 1/4 cup =’s 2 ounces). 14 ounces would = one and 3/4 cups. Glad it turned out good and that you and your children enjoyed it. Perhaps using the 10 ounces will make it even better. Do you have any for plant or nut milks? Maria, that’s not correct. 1 1/4 cups is 10 fluid ounces, not 14. Tessa, as I’m sure you know, the freeze-and-stir method is not technically ice cream, it’s a semifreddo. Still delicious. With the bag method, make sure you leave a bit of air in the bag; it will get broken up into tiny bubbles which will lighten your ice cream a bit. If you have a vacuum sealer, put the zip-top bag into a vacuum bag and seal it; that will guarantee no leaks! Thank you so much! My husband is addicted to the chocolate 2 ingredient method version. Do you have a recipe for a pumpkin version? I was going to wing it, but I don’t want to screw it up! Yay! I’d add in 1/2 cup pumpkin puree + as much pumpkin pie spices as you prefer! ciência A partir de que se conhece ao longo de gente, essa espécie humana busca explicações para planeta ao lhe redor. I just made the 2-ingredient version last night and added 3/4 cup of puréed soursop, one of the delicious fruits we have in abundance here in the Virgin Islands. I didn’t have an airtight container, but I put the mixture into one of my 9 x 4 Fat Daddio round aluminum cake pans, placed cling wrap over the surface and covered everything up with another layer of cling wrap over the top. In the freezer overnight, and the first thing I had out of bed was a spoonful of tasty, creamy soursop ice cream…no need for an ice cream maker! Thanks a million! I’m gonna try guava and passion fruit next! thanks ice cream short cut .i will try your ice .thanks linda .from texas. hello for recipes short cut .i will try your ice.thanks ! linda from dallas. Hi Tessa – I made the two ingredient method and the consistency was fantastic, however, the taste was a little funky. I added a 1/2 cup of Hersheys Syrup; perhaps that was it ? I am not sure. It made a great milk shake though ! I am going to try the other method and see how that tastes – rocky road this time. Thanks for these recipes! I’m thinking of making the 2 ingredient one, but i’m all out of condensed milk, so could I just use normal milk? Or even soymilk? If not, i will be sure to head out to the store and get some condensed milk! Thanks for your time! Condensed milk is key for the two ingredient method! Is there something I can use in place of the condensed milk. My husband is diabetic so I’m shooting for as close to sugar free as possible. world, right after launching it generally in the Usa and U.K.
video and voice yet, all those call for a connect-in installation). I would LOVE to try this sometime. Do you have a link for a good stainless stell baking dish?